About us – Yes, Bulgaria! Since the summer protests of 2013 and since the prevented attempt for a radical judicial reform of the coalition government, created after the protests, we, a big group of politically active Bulgarian citizens, have reached the conclusion that the opportunities for a meaningful political change through protests and through public pressure have been completely exhausted. That is why, in January 2017 we created the political party Da, Bulgaria Movement as the instrument of the highly demanded reforms. In March 2017, Da, Bulgaria took part in the Parliamentary elections as a part of a coalition, which won 2.96% of the votes. 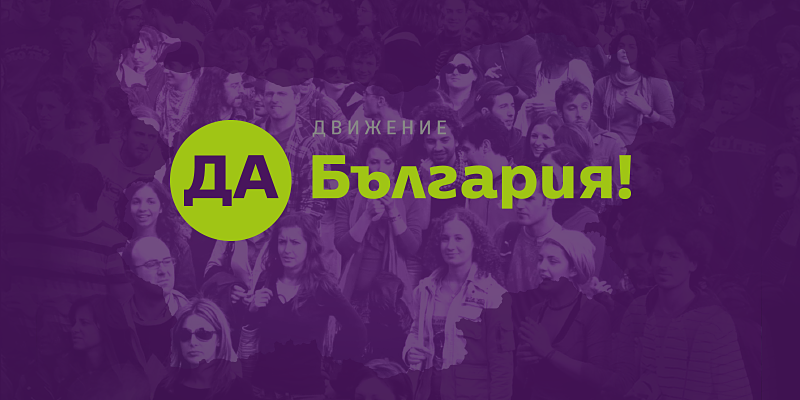 On April 12th 2018 Da, Bulgaria Movement together with the parties Democrats for Strong Bulgaria and The Greens (Bulgaria) founded Democratic Bulgaria Union, aiming for freedom, preserving the Euro-Atlantic orientation and establishing the rule of law in Bulgaria. give back the power to the citizens through the creation of strong institutions. The Movement aims to counter poverty and the growing social inequality. Da, Bulgaria Movement has made a strong commitment to the transparency and the accountability of the administration, as well as to the Bulgarians, both living abroad or at home. Da, Bulgaria aims to help the Bulgarian business to be more competitive, through stimulation of innovation and through strengthening its ties to education and science. Da, Bulgaria aims to create working regulatory agencies, which should destroy the monopolies and deter cartels. Da, Bulgaria will introduce educational standards that match the requirements of the contemporary world and help prepare active and competent citizens. Da, Bulgaria will support the Bulgarian culture and help it reach deserved recognition in Bulgaria and beyond. Da, Bulgaria will develop quality healthcare and integrate modern electronic services in it. Da, Bulgaria will lead foreign policy that will guarantee full fledged and active EU and NATO membership, as well as a well deserved and respected place among other European nations. The sovereign body of the Movement is the National Conference, in which all party members may take part, vote and make statements. The National conference approves, alters and appends the Statute of the Movement, elects a Chairman, a National Council and a National Control Commission. The National Council is the representative collective body of the Movement with a 3 year mandate. It consists of the Chairman and not less than 50 members, elected at the National Conference. The National Council elects from its ranks an Executive council, which is assisting the Chairman in the performance of his duties between National Conferences. The National Council approves the Political Program and shapes the fundamental attitude of the Movement towards general policy issues, sets the rules for nominating candidates in elections, decides on the general issues, regarding relationships with other political entities, approves the annual budget and the annual financial report of the Movement as well as decides on issues, not mentioned in the Statute. Work groups, consisting of experts and members of the Movement take part in the shaping of the policies that become part of the Political Program of the Movement. The Local committees of the Movement are engaged in day-to-day contact with the local communities and express the political ideas of the Movement on local and municipal level. The National Control Commission is the control body of the Movement that is obliged to monitor abiding the Statute and resolve arguments, regarding its interpretation and application. The Chairman of the Da, Bulgaria is conducting the day-to-day coordination of the Movement and is responsible for its political activity. Hristo Ivanov is the Chairman of Da, Bulgaria. He is a Bulgarian politician, lawyer and former Minister of Justice and Vice Prime Minister of Bulgaria between August and November 2014. On August 6th, 2014 he was appointed as a caretaker Vice Prime Minister for Justice, Internal Affairs and caretaker Minister of Justice of Bulgaria. Hristo Ivanov resigned as a Minister of Justice on December 9th, 2015 when the radical judicial reform he proposed, was not approved by the Bulgarian Parliament and later became a founder and a leader of Da, Bulgaria.